Enchant­ing Chamonix chalet for ten with hot tub & sauna. Ski lift & village with bars & restau­rants close by. Perfect for winter and summer, family friendly with enormous garden & spectac­u­lar views. Winter weeks from €2600 for eight people or €2900 per week for ten. The chalet combines a warm, traditional feel – a log fire, waffle bathrobes, thick fluffy towels & high quality bedli­nen – with modern comforts: hot tub, wifi, BOSE stereos, widescreen TV & Nintendo wii. We’re family friendly: children & babies are welcome. It’s a short walk to the Flegere lift, Chamonix’s largest & sunni­est ski area. Village with bars, shops and restau­rants: 5-10 minutes walk. Chamonix centre is 5 minutes by car or a 20 minute stroll. Cross-country skiing, winter walks and snowshoeing from the chalet. In summer, step straight out to walking & cycling trails: start classic Alpine walks from the door. Idyllic summer and magical winter in photos. See up to date availability & pricing, and read our reviews. We have five stars on Facebook, Google, Tripadvisor and HomeAway. Flexible dates outside peak times, self-catering or catered. 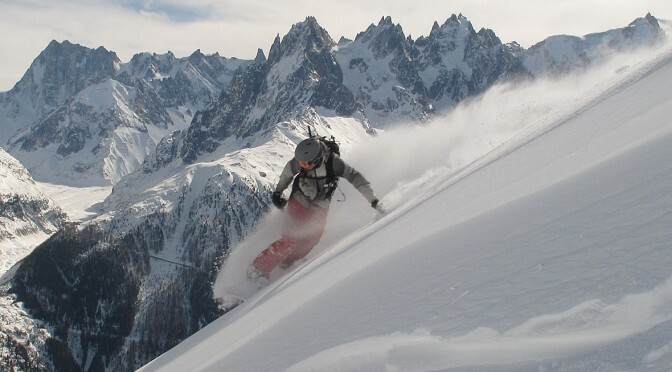 Chamonix is among the world’s top mountain destinations, winter or summer. With excellent travel options (1 hour from Geneva airport) it’s a lively, beautiful town surrounded by charming villages. The cirque of magnificent mountains provide some of the finest lift-served skiing and hiking on the planet. It’s equally enjoyable if you don’t ski, with endless ways to enjoy the fantastic scenery, from cable cars & railways to huskies or helicopters. Or just relax and enjoy the spas, culture & restaurants. New to Chamonix? Here’s five things not to miss. Or if you’re a regular visitor, seek out some of Chamonix’s hidden gems. Walking, cycling, family activities, cable cars & mountain railways, lunching or just relaxing in spectacular landscapes, Chamonix summer has it all. If alarm bells ring, here's some advice to check up on.